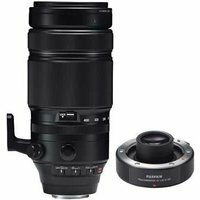 The 1.4X teleconverter when used with the Fujifilm 100-400mm f4.5-5.6 R super-telephoto lens provides wildlife and sports photographers with a 140-560mm f6.3-8 or 213-853mm (35mm equivalent) lens in a compact package. Phase detection AF shooting remains possible, even at F8. The 100-400mm is perfect for shooting a variety of subjects handheld, including portraiture, and fast-moving subjects.